IDF agrees to relax security so Christians living under PA can celebrate with family in Israel. IDF officials announced Wednesday that security restrictions will be relaxed during Christmas to allow Palestinian Authority residents who celebrate the holiday to enjoy the festivities, and to visit family in Israel. The decision was coordinated with Palestinian Authority officials, PA security personnel, and representatives of various international bodies. 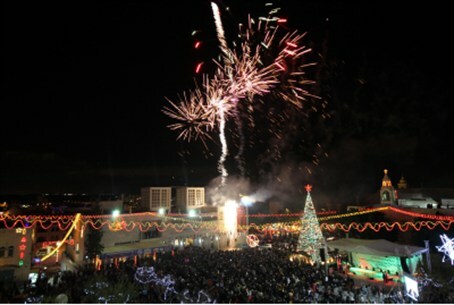 Christians living in PA-controlled regions in Judea and Samaria will be allowed to enter Israel during the holidays. Normally, PA residents seeking to enter Israel are given a permit only under certain circumstances, such as employment or studies within Israel. Additional soldiers and Border Police will be stationed near Bethlehem in particular to ensure that Christians from the city can pass through security checks between their town and Jerusalem quickly despite the expected high traffic during the holidays. Visitors from PA areas will be permitted to hold organized tours within Israel, in coordination with the Israel Police. Hundreds of permits will be given for Palestinian Arab Christians who do not live in Judea and Samaria to visit the region. In addition, five hundred Christian residents of Gaza will be permitted to enter Israel and PA-controlled regions of Judea and Samaria. Restrictions will not be entirely lifted for Gaza residents, who live under the leadership of Hamas, which openly seeks Israel’s destruction. While hundreds will be allowed to visit, permits will not be given to Gaza residents ages 16-35. The special holiday measures have been approved by Defense Minister Moshe Yaalon and IDF Chief of Staff Benny Gantz.